Where is the best place in my house to put a gun safe? It depends on how frequently you intend to access the gun safe’s contents and how rapidly you need that access. Basically, if you’ll be taking guns in and out often or want to be able to grab them as soon as possible after a need arises, you’ll probably want to situate your gun safe in or very near the room where you normally spend the most time or where you anticipate being at the moment that need materializes. But there are other considerations too, such as the type of gun safe and its weight. Do I need to reinforce my floors to support the gun safe’s weight? Possibly. The weight of your gun safe won’t be an issue if you plan to set it atop a concrete slab. However, placing it on a floor made of wood might be an issue if your home dates back to a time when building codes were less stringent than they are now or if the joists and floorboards have sustained damage from insects or rot. To be sure your floor’s wood can handle the load of a gun safe, consult a qualified construction contractor or building inspector. Will I still be able to open my Old Glory gun safe if there’s a power outage and I don’t have a backup source of electricity? Yes. Power is normally required to operate the quick-access digital lock. However, the lock comes with a mechanical override that lets you manually open the door. This safeguard ensures you’ll be able to get to your guns in the event of any type of lock failure, including that which results from vandalism or attempted break-in. Why do Old Glory gun safes have three hinges on the door? Because two hinges—the number used by most other gun safe manufacturers—are insufficient to prevent the heavy, thick metal door from warping. Door warping is a leading cause of gun-safe failure. Old Glory gun safes are not vulnerable to door warping thanks to their three-hinge construction. Where do you make Old Glory Gun Safes? They’re designed right here in the U.S.A. To hold down the costs of producing each of our supreme-quality gun safes, we do delegate some of the manufacturing work to plants outside our borders including China, Mexico as a supplement to the contract safe-making performed at our partner factories in California. 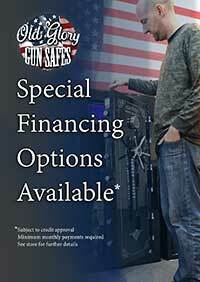 I just today bought a gun safe from Old Glory Gun Safe Company. When can I expect it to be delivered? Your newly purchased gun safe will be on its way to you the same business-day you ordered it, if you completed your purchase before 1 p.m. Pacific time, Monday through Friday (otherwise, it will be shipped the next business day). We ship via common carrier, so look for your In-Stock Old Glory gun safe purchased today to arrive in the next week or two, if the gun safe is out of stock the safe will be delivered within 6 to 8 weeks with online updates as to the progress. Yes. You can save on shipping costs if you agree to pick up from a designated freight warehouse in your area rather than have the gun safe delivered right to your door. Or, you can come to our Missouri showroom or California factory and pick up on a “will call” basis. FREE SHIPPING is on all premium gun safes and includes delivery into your garage in the 48 continental U.S.A. If I’m not at home when the delivery truck shows up, will the safe be left on my doorstep? No. To prevent that sort of occurrence, the carrier will contact you in advance to make a delivery appointment. This will allow you to arrange your schedule so that can be present when the delivery takes place. Can I track the status of my gun safe delivery? Yes. You’ll be given a tracking number and all other necessary information to let you follow the progress of your delivery. By that we mean the carrier will, if you so desire, drop off your gun safe inside your home’s garage or carport. There is no extra charge for this service. However, it’s available only to most locations within the continental U.S. And your garage or carport must offer flat-surface access so that the wheeled pallet jack upon which the safe sits can be easily rolled from the delivery truck to the spot where you want the safe placed. After my Old Glory gun safe is delivered, will the carrier unpack it for me and take away the packing materials. The carrier only delivers. You’ll have to unpack the safe and dispose of the packing materials yourself. I live in a high-humidity location. Will moisture in the air affect the performance of my Old Glory gun safe? Not if you take steps to control humidity inside the safe. Unchecked, humidity can cause interior condensation to form. You can prevent this by placing within your safe a powered dehumidifying rod or a non-electric, disposable dehumidifying agent (available at many hardware stores). Using NATO-approved BullFrog rust-and-corrosion blocker (which comes in the form of emitter strips, cups, and shields plus sprays and wipes) is highly recommended. Do Old Glory gun safes come with a warranty? Absolutely. In fact, our gun safes come with a lifetime warranty so that, if ever your Old Glory gun safe stops working due to mechanical malfunction or is damaged as a result of a fire or burglary, we’ll repair it onsite or replace it at no cost to you. We can make such a pledge only because Old Glory Gun Safe Company manufactures such supremely durable, reliable, high-quality gun safes. Does my Old Glory Gun Safe Company lifetime warranty end when I sell my gun safe? No. The warranty is for the life of the gun safe, not the life of your ownership. When you sell, bequeath, gift, or otherwise transfer ownership of your gun safe, the warranty remains fully enforceable by the new owner.